Caffeine has been a troublesome molecule for me. Red Bull once made my chest hurt badly, and I also ended up with a year worth of sporadic palpitations (daily, but they tapered down from far too frequent for comfort to a few PVCs a day) from drinking coffee, and then working out hard, before running up a hill back home. I have been much more careful about coffee consumption since. Yesterday, I learned that caffeine decreases melatonin levels. I’ve had caffeine (from tea alone) really screw up my sleep cycle over the last two years. Tea can lead to serious caffeine burnout when you come off. The first time I came off a heavy tea habit, I ended up sleeping for days, which makes caffeine sound like a much stronger drug than it is. I’m caffeine sensitive. Not everyone is, but to do what I do (sell tea! ), I’m expected to drink a lot of tea. Well, I can’t anymore. I do still have hefty 18g high roast TGY sessions on my own, but if I do, that’s all the tea I want for the day! I’m also sensitive to compounds in yerba mate, and nicotine, especially from cigarettes, can give me palpitations. I have used tobacco sporadically since I was 18. I think I’m done with smoking tobacco. I have a lovely collection of pipes, and a humidor full of Cubans, but it looks like I need to step away from tobacco pretty much entirely! A lack of sleep is linked to faster aging, hormonal imbalances and even anxiety and depression. I’m going to come back to this post and add more info as I go, but for now, these are my conclusions from the last ten years of heavy caffeine use. I’ve even been hooked up to an EKG for palpitations twice. It took me a while to realize it was caffeine giving me premature ventricular contractions (PVCs)! Caffeine is not something to be underestimated. While I’m quite sensitive to caffeine, there are people who are much more sensitive to it and these people can have panic attacks on much smaller doses. I’ve almost had anxiety attacks from coffee (but not tea). It appears theanine does have a modulating effect on the negative side effects of caffeine. Other polyphenols also seem to have this effect: EGCG for one. Green tea can actually reverse the side effects of caffeine and put me to sleep in the morning if I need to get an hour or more of sleep to catch up on my sleep debt. Oddly, there are other, aged teas, that also put me to sleep (both oolongs and pu erh). I have no doubt that there is more than EGCG at work in green tea. Gallocatechol, for example, is a polyphenol found in green tea, bananas, persimmons and pomegranates. Gallocatechol has been found to have an affinity for human cannabinoid receptors. Green tea, for me, has more positive benefits on my health and wellbeing than any other type of tea. The polyphenols in tea have a host of health benefits! Even 1950s pu erh can be relaxing for me. This was a surprise to me: the tea had seen decades of humid storage here in Hong Kong and Taiwan. Hot summers and cool winters really helped break down the material and many of the compounds within the tea to simpler substances. 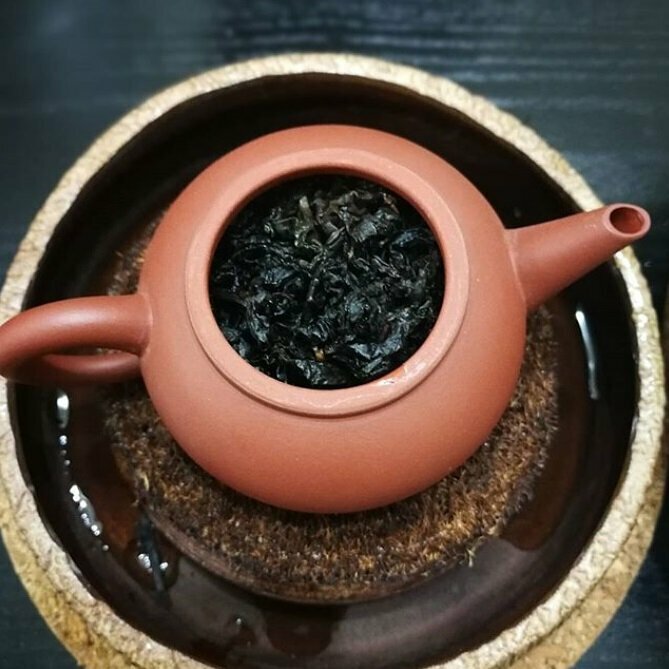 The sample of 50s pu erh I got to try left me filled with calm and relaxed. Why? I couldn’t tell you. That tea was offered on the standard menu at Wistaria Tea House in Taipei, and was quite the eye opening experience. So much so that I will never forget that feeling of serenity. It was a little musty tasting, but the physical effect and silky smooth liquor made it worth trying. Tea is lovely, but like all good things, it should be consumed in moderation. Tea can cause kidney issues if consumed in excess. Tea can even cause fluorosis in certain populations that use tea made with older leaves and stems, both of which contain high levels of fluorine!